One of Ian Garrick-Bethell's research interests is the long wavelength (3000-km-scale) shape of the Moon. The shapes of many small satellites in the solar system are dominated by tidal forces from the primary bodies they orbit. Presently, tides from the Earth deform the Moon by less than 10 meters. However, the observed lunar topography has permanent, kilometer-scale deformations at tidal wavelengths. What are the origins of these deformations and how do they control the geology of the Moon? How do they control which side of the Moon we see in the night sky? One of his hypotheses is that the Moon experienced strong tidal heating when it was closer to the Earth billions of years ago. The heating pattern may have altered the crustal structure of the Moon, and thereby the Moon's shape. In addition, the Moon's largest basins (craters) influence our interpretation of the lunar shape, and ignoring them helps us understand the appearance of the Moon just after its crust formed. The figure above shows the observed shape at left, and a model for the shape (from tidal heating) at right. While the Moon has no global magnetic field like the Earth's, it does have patches of strongly magnetized rock distributed throughout its crust. Discovered during the Apollo era, the origin of these features is uncertain. In addition, many of these features are associated with unusual swirl-shaped color features on the surface, some of which can be seen with a pair of binoculars. 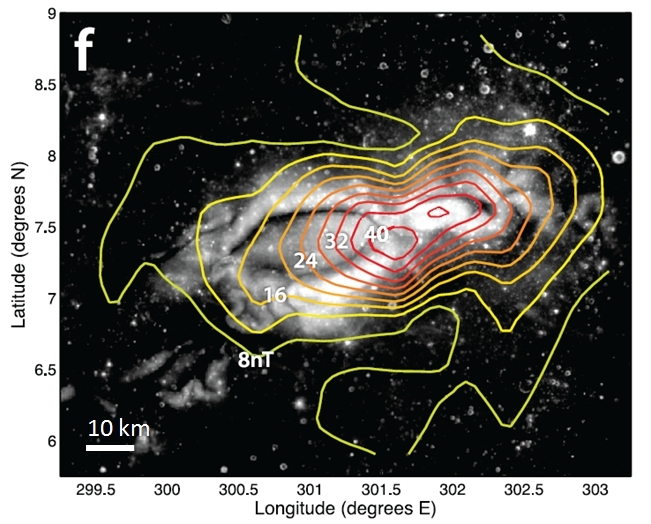 We have explored two different hypotheses for the origins of these swirls: 1) Fine, electrically-charged dust is accumulating in the swirl region, due to plasma interactions with the local magnetic field, and 2) The underlying surface is being protected from the darkening effects of solar wind plasma, due to deflection of the plasma around the magnetic field. The figure below shows Reiner Gamma swirl and its magnetic field (from Hemingway and Garrick-Bethell (2012)). Part of the problem in determining the origins of lunar magnetic fields and their underlying swirl patterns is that previous spacecraft have only acquired data from above ~20 km altitude. Ideally, one would land on the surface with a rover to make measurements of the magnetic field and solar wind flux, but the costs of such a mission are prohibitive. To address this problem, he has developed a low-cost concept that sends a cubesat on an unbraked impact trajectory into the heart of a swirl. The cubesat transmits measurements in real-time to the Earth, up until the last milliseconds, enabling measurements at less than 100 meters altitude. The cubesat platform would be partly based on the 3-Unit UC Berkeley/Kyung Hee University CINEMA cubesat (which includes a small scientific magnetometer), now in orbit. A cubesat capable of such a lunar mission would also have many other uses for near-Earth space measurements. The figure below illustrates the Lunar Impactor concept (from Garrick-Bethell et al. 2013).